Trail mix granola! Healthy baked granola clusters of almonds, sunflower seeds, and walnuts. 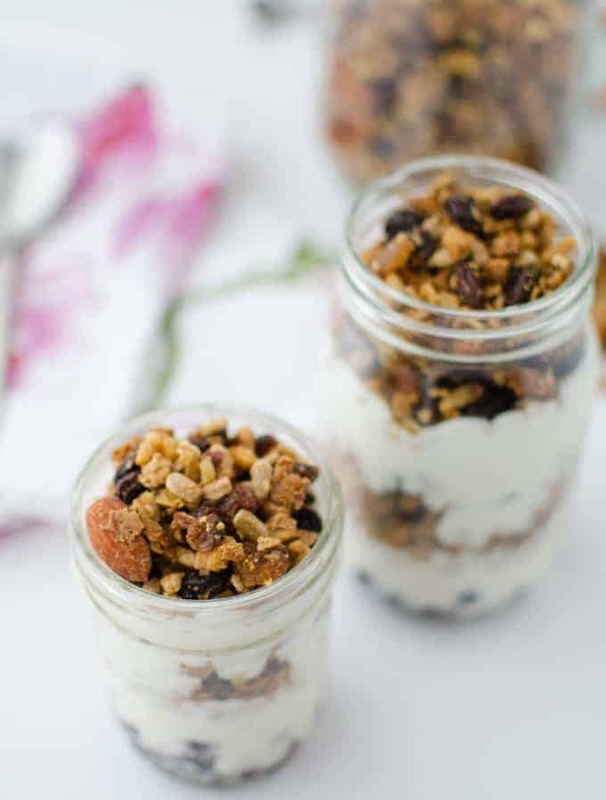 Layered in jars with frozen fruit and yogurt for a quick on-the-go breakfast! What is it about granola that makes all portion control rules go flying out the window? It’s the reason I started making my own granola years ago; I wanted to be able to eat fist-full after fist-full without having to consume an entire day’s worth of calories. Oat clusters. Toasted nuts. Dried fruit. Gimme. All of my favorite snacks rolled into one. It’s no wonder I sometimes ask BL to hide the granola jar and not tell me where he put it- no matter how much I beg for it later. 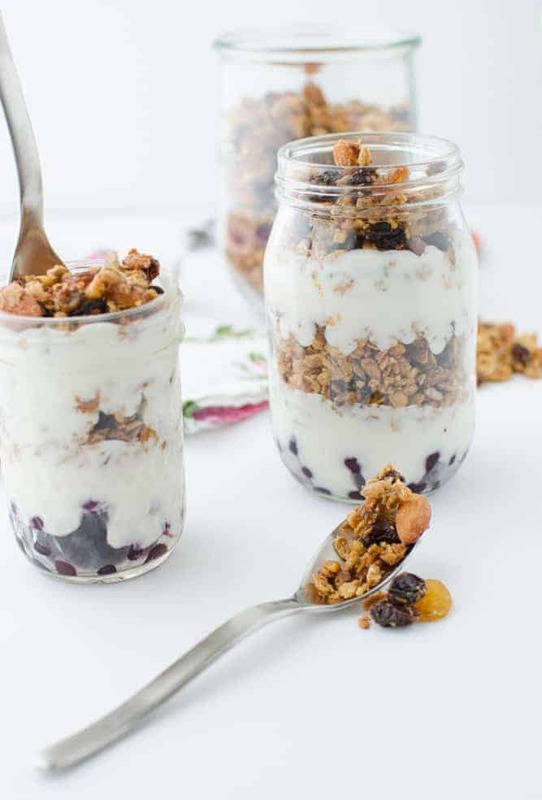 To aid in fullness, let’s take granola and make it into a parfait! Not only is this a much fancier way to enjoy it (read: not sitting on the couch pouring the granola into my mouth), but it also allows me to have a gigantic snack/meal without blowing my calorie bank. This parfait is what nutrient dense dreams are made of! I like to make these jars ahead of time so I can bring them with me to enjoy alongside coffee at my desk. To assemble, I place a 1/2 cup or so of frozen fruit at the bottom. Why frozen? Besides the fact that it’s 1/2 the price of fresh fruit, I don’t notice the texture difference when I cover it in yogurt and crunchy granola. Wild blueberries are my favorite here. Then I top with a generous serving of yogurt. Any kind will do! For my dairy-free friends, choose a coconut or soy variety. As you may be aware, I have a slight thing for coconut milk- and coconut yogurt is no exception. Trader Joe’s brand, naturally, is my go-to. Vanilla is the best! 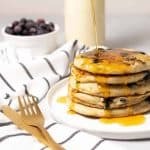 Need more healthy oat filled ideas for breakfast? 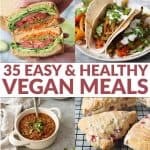 Try my overnight pumpkin oatmeal, pumpkin-maple oatmeal in the slow-cooker, cherry pie oatmeal, baked oatmeal with berries, oatmeal pancakes, apple pie oatmeal, or tropical oat & groat granola. In a large bowl, combine the oat flour, remaining oats, mixed nuts, dried fruit, and cinnamon. In a medium saucepan, heat the brown sugar, honey, coconut oil and water. Bring to a boil until mixture bubbles. Reduce heat to low and add the salt and vanilla extract. Pour the mixture over the oats and nuts. Stir together and let sit for 10 minutes. Pour the mixture onto the baking sheet and firmly pack down. Bake for 25 minutes until golden brown. Remove and stir together to break up some of the clusters. Break to cooled granola into clusters. 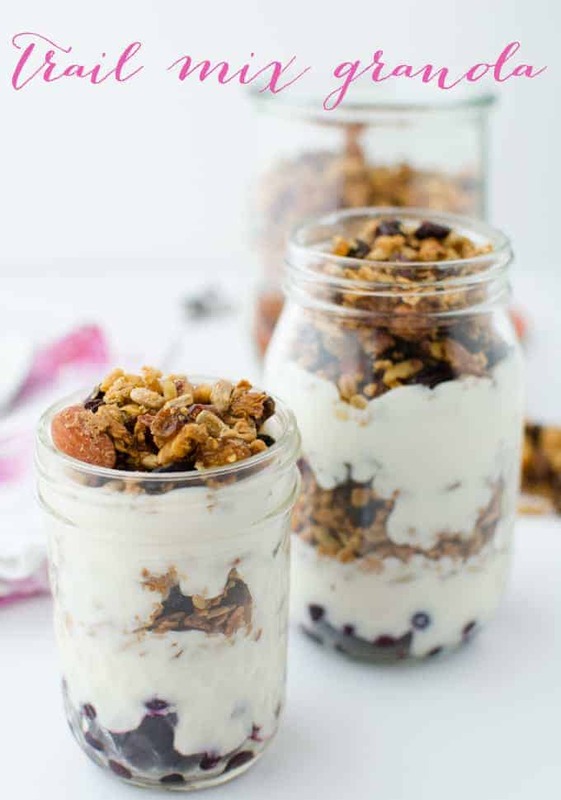 For the parfaits, layer the yogurt and granola. 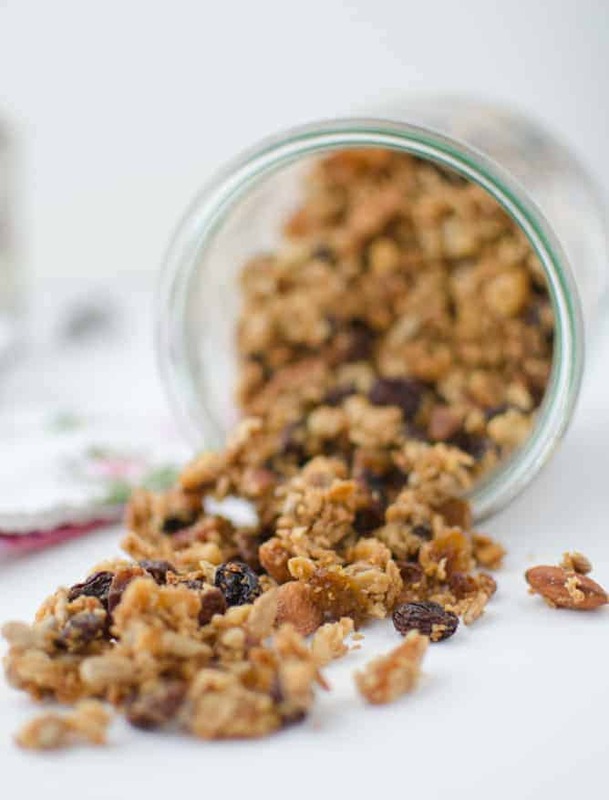 I am happy to hear I’m not the only one head over heels for good homemade granola! 🙂 Can’t wait to try this trail mix version – yum! 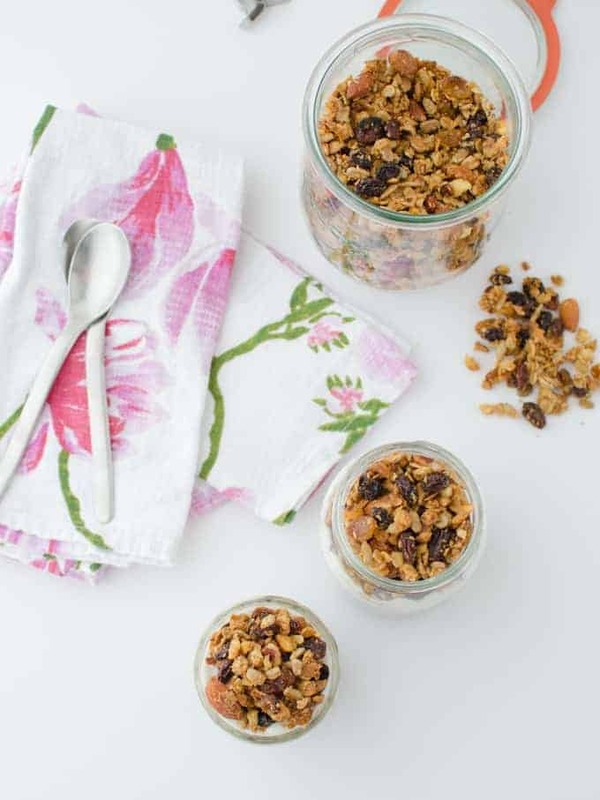 Home made granola with yoghurt is my breakfast staple, I have it almost every morning! I definitely need to make mine into little parfaits next time though, these look so cute and delicious! Thanks for the idea! Nutrient dense dreams… I love it! Parfaits are one of my favorite foods and these look so delicious. Love finding healthy versions of foods that are typically packed with sugar!